In a move that could help decide the future of GM crops in Africa, Burkina Faso has abandoned GM Bt cotton. The country has begun a complete phaseout of the crop, citing the inferior lint quality of GM cultivars. This story of a major GMO failure is documented in a new briefing by Brian Dowd-Uribe, Assistant Professor in the International Studies Department at the University of San Francisco and Matthew A. Schnurr, Associate Professor in the Department of International Development Studies at Dalhousie University. The briefing appears in the journal African Affairs, which is published by Oxford University Press. The briefing traces the rapid decline of Burkina Faso’s cotton crop following the introduction of GM Bt cotton. At the time, Burkinabè cotton was renowned for its high quality, the product of a highly successful non-GM breeding programme founded by the French government and spanning 70 years. 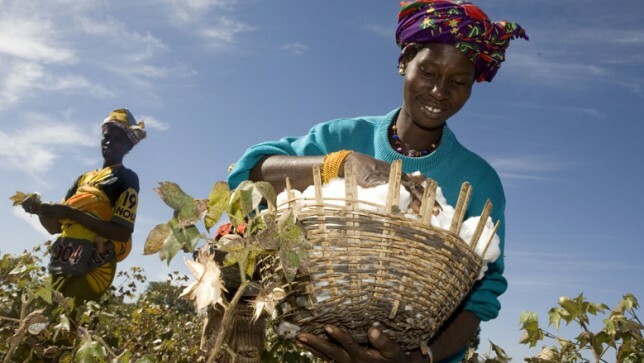 The main goal of the breeding programme was to create cultivars that were well adapted to the growing conditions in West Africa and had the desired quality characteristics, such as a high ginning ratio (the percentage of the desired cotton fibre per unit weight of cotton delivered to the factory) and long staple length. When Burkina Faso first grew GM Bt cotton in field trials, officials were initially satisfied with the quality of the cotton, the briefing states. The quality characteristics for which Burkinabè cotton was famous were maintained. GM Bt cotton was commercialised in Burkina Faso in 2009. But during the first years of commercial release, Burkinabè officials noticed declines in staple lengths and ginning ratios. Monsanto employees blamed water stress and other weather problems. However, the quality problems persisted and by the 2013/14 season over two-thirds of the nation’s crop was classified as lower-quality medium staple length, with only a third retaining its previous classification as medium to high staple length. The ginning ratio remains well below the 42% achieved by non-GMO cultivars. The story of the decline of Burkina Faso’s cotton points to a problem with the GM process in general – that of pleiotropic effects, which means that the inserted GM gene influences other seemingly unrelated genes. In theory, as the new briefing notes, inserting the Bt gene into the Burkinabè germplasm should have left the resulting GM crop identical to its parent in every way except for the inserted trait conferring insect resistance. But in reality, the process of inserting the Bt trait into the local variety appears to have interfered with some of its most important characteristics. Monsanto scientists “are at a loss to explain the precise mechanism that has created these problems”. The companies plan on reducing the amount of Bt cottonseed on the market from 53% in 2015/16 to 30% in the 2016/17 growing season, with the goal of a complete return to non-GM cotton in time for the 2017/18 season. They are also demanding USD 280 million from Monsanto in compensation for losses incurred due to declines in quality since 2010. Will Africa turn its back on GM? Dowd-Uribe and Schnurr conclude that Burkina Faso’s phase-out could stall or even end negotiations to adopt GM cotton in other African countries with similar concerns over cotton quality. They go further, adding that the reversal on GM cotton could undermine public trust in GM crops in general across the continent, at a time when many African countries are grappling with the choice of whether to adopt the technology.